This Cushion set is available in over 600 fabrics. Use the drop down menu to select the color for your custom made cushion set. 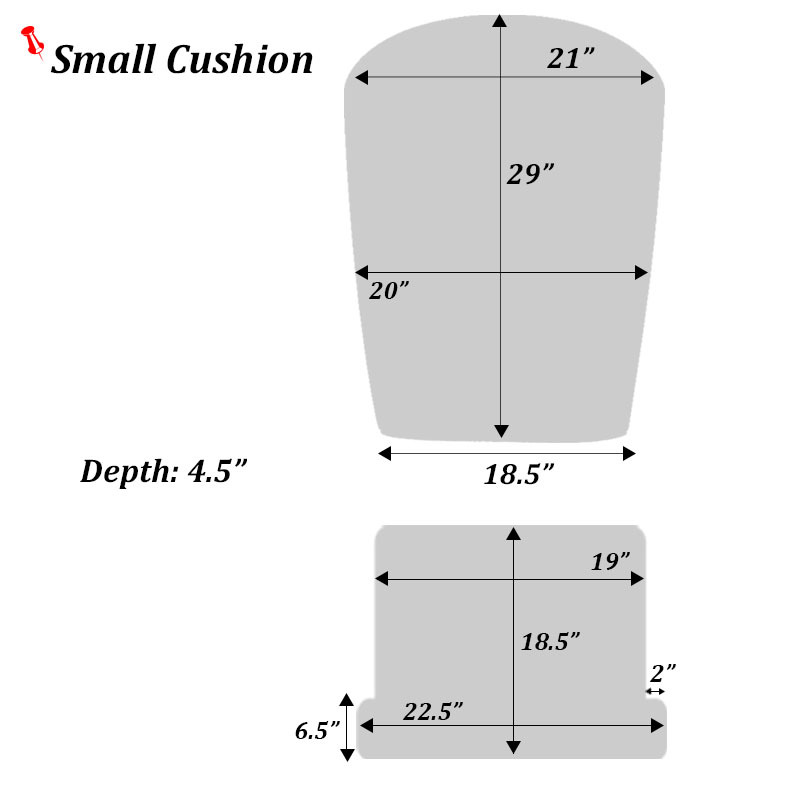 Very hard to find Glider Rocker Replacement Cushions. Renew that old glider rocker and add a flash of GENIUS! Our cushions are very high quality cushions specifically designed for glide rockers. The seat cushion has no ties as it is designed to stay in place via gravity. The back cushion will also stay in place but it has two snap ties, one on either side of the top of the cushion, that are just over 4 inches long. If by chance your present glide rocker has these snaps, awesome. If not, you may want to cut these ties off or add to the length of them. Be creative but be careful. 95% of orders for this product are shipped within 3-4 weeks plus transit time. These cushion sets are all custom made. RETURN AND CANCELLATION POLICY: Please note that our glide rocker replacement cushions are all custom sewn for you when you order. We do this so we can offer many colors. Cancellation of an order is generally impossible as we start sewing ASAP. We can only accept returns within 30 days of order, a 50% re-stock fee will apply, and the cushions must be in original packaging. Please note that you are responsible for all shipping costs. I received my Glider Rocker Replacement Cushions today. They are beautiful! Thank you so much for a job well done!!!!! I love the cushions and the fabric I ordered for my glider rocker- it looks like brand new! So glad I ordered samples to view fabric first- the one I ordered wasn't my first choice until I saw the sample. I missed the note about the top snaps/ties, but will work with them as I do not have the chair snaps. Would prefer just longer ties, but other than that, VERY happy with my new glider!! I am very happy with the glider rocker cushion set. The man I talked to when I ordered it was very helpful and polite. Ordered this cushion and it was beyond my expectations Well worth the money! Color is perfect for my room. Customer service was not only patient but very knowledgeable about colors and designs. Thank you so very much! My mother-in-law had a 30 year old platform rocker that she insisted on taking with her to her assisted living apartment recently. We talked into replacing the cushions, then could not find any to go with the new sofa we purchased for her. So I turned to the internet and found you guys! What a relief and what a wonderful experience! I received a phone call right after the order verifying my wishes. My MIL loves the new cushions from the color to how thick and soft they are. She has back problems and the cushions are just what she needed. She (and I) could not be happier! Thank you! The customer service was fabulous; the gentleman was very patient in trying to find the proper fabric swatches. And, the end product fits perfectly; the color and texture go with everything in the room. Thanks you. I love my new cushions! Very nicely made, dimensions are as described, and excellent service! I purchased several fabric swatches before making a final decision on which I preferred. The swatches arrived in just a few days. Seeing the fabric first hand is essential, since colors can be so different online. Thank you Travis for your service. Excellent customer service! The young gentleman who helped me with my color selection was right on! High quality cushions and they fit perfectly! Very satisfied customer. It was perfect. Exactly what we were looking for. We especially liked Fine Web adding the tabs with snaps on the back cushion. 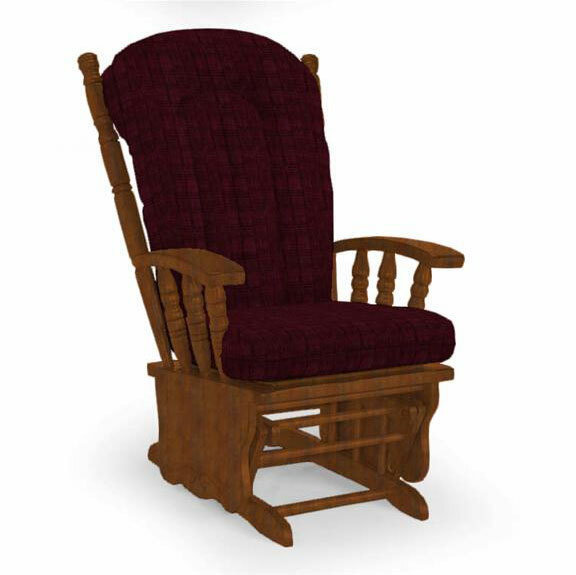 Our rocker did not have snaps but it was easy to get a couple at a local upholstery shop and add them to the rocker. We'll definitely recommend Fine Web. A quality store.